Inkjet printers have been on the market for quite some time. Today, they offer print quality comparable that that of a photo lab, they’re easy to use, and cheap to buy. But as many of us have learned the hard way, their cheap purchase price is offset by their extremely high ink cost. If you print a lot of documents, it’s easy to feel like the costs are getting out of control. Even the cheapest ink on the market costs more than a fine wine, while some of the high-end ink costs more than Chanel perfume. If you’re the type of person who buys paper by the box, you’re probably under the impression that a laser printer is the only way for you to get a bargain. This might work fine for black and white, but color laser printers cost a pretty penny. With Epson’s EcoTank system, consumers get the low print cost of a laser printer, combined with the ease of use that comes with an inkjet. Advertised as having enough ink to last you two years, the ET-2600 and ET-2650 look like a pretty good bargain. We went hands-on to find out how it performs in the real world. The ET-2600 and ET-2650 allow you to say goodbye to the ink cartridge. With the print heads built right in, this printer stores all of its supplies in four easy to fill tanks located on the side of the printer. Refills can be purchased by the bottle, and simply squeezed right in. Beyond this particular feature, it seems to be a pretty standard all-in-one printer. 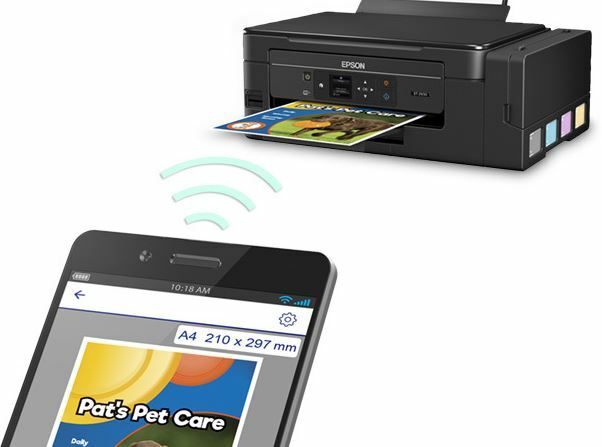 It can scan, copy, and print wirelessly, covering all the needs of most home and small business users. Measuring 20.8 x 17.5 x 11.9 inches, this is a little larger than your average printer. That being said, it still fits comfortably onto most desks, with the tray folding up into the base. Although fairly minimalist in design, the printer has a nice modern look to it. It’s got a very clean, squared off appearance, with the angled control panel providing a sleek touch. The controls themselves are very straight forward. There is a dedicated power button located prominently on the left side, with the remaining buttons dedicated towards specific tasks. There is a button that will start a scan, start a copy, stop the job in progress, and change the paper settings. Should you ever run low on paper or ink, one of the two LED indicator lights will let you know. Chances are, you’ll always known when you’re close to running out of ink. The four tanks located on the left side of the printer have clear, see through windows. This lets you see the current ink level, making it clear when they need to be topped off. Early wireless printers were often pretty finicky to get going. We’re happy to test a printer where the setup procedure is quick, simple, and straightforward. There is, however, one additional step – filling the tanks. This is the first thing that needs to be done. The guide makes it sound quite challenging, suggesting that you wear gloves and put down paper. If anything, this is more of a precaution. We didn’t even spill a single drop of ink. The ink does need a few minutes to settle before you can print, giving you enough time to complete the setup wizard. To start the wizard, you can download the software from Epson’s website or insert the included CD. It will ask you a few questions about your network and use, then prompt you to plug in the printer via USB. Once done, it will download all of the settings you chose during setup and save them in the printer. Even if you’re not technically skilled, you’ll have no problem getting this printer running. This printer accepts standard paper, as well as legal. Epson is known for their high-quality inks, so of course they also support use of high end photo papers. You can fit 100 sheets in the paper tray, although this is reduced with some thicker specialty papers. Although it’s not sold as a photo printer, the image quality is just as good as many other mid-range photo printers. Epson makes some of the best photo printers on the market, and full time photographers could certainly upgrade. But for casual home use, The ET-2600 and ET-2650 are more than accurate. Colors are very well balanced, with a natural feeling to them. Even fine details were printed with high precision, and there was no hint of banding or distortion. That being said, most people will be using this printer for documents. Often, business users like to shy away from inkjets as they prefer the high contrast look of laser printers and sharp edges. But this isn’t really true of modern inkjets. The Epson ET series printers have an extremely fine print head, and text comes out looking razor sharp. Their unique pigment based inks are very flat and smooth, and you’d likely need an expert to tell you that these weren’t laser printed. For an inkjet, the ET-2600 and ET-2650 are really quite fast. If you’re just printing black and white documents, you’ll be able to print 10 pages per minute. With color, this speed drops to 4.5 pages per minute, a little over 10 seconds per page. This printer is really good at determining how high of print quality you need. The figures above are for text based documents only. The speed won’t be impacted much if you have a few simple diagrams. But if you’re printing high quality photos, you can expect up to 30 seconds per page. While this might seem pretty slow in comparison, the fact that this printer takes its time means that the quality is above average. We were very impressed with the quality of the scanner included in the Epson Expression ET-2600 and ET-2650. 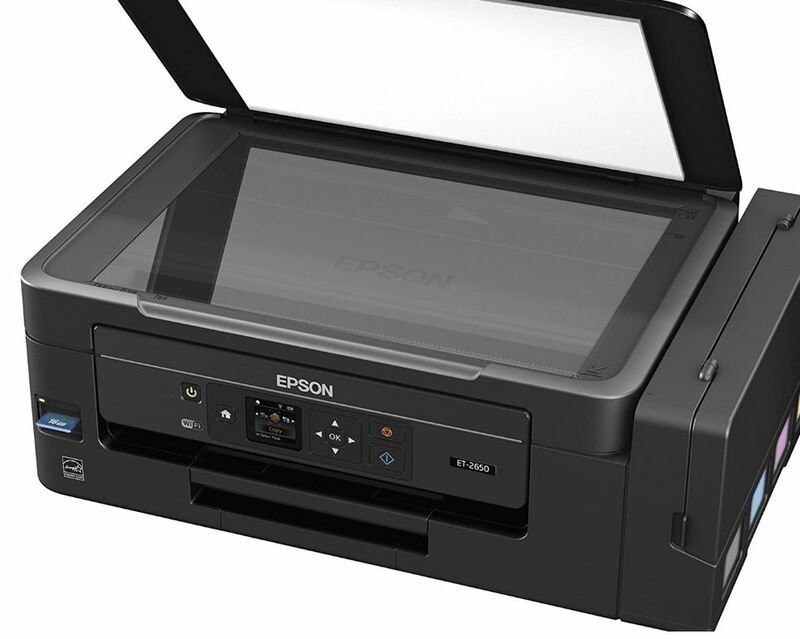 It can scan documents at the same 1440 dpi as the printer, making it suitable even for scanning photos. The color is very well calibrated and balanced, making it great for artists. When you’re copying documents, the scanner operates quite quickly. You can expect total print time of 7.7 pages per minute in black and white, or 3.7 ppm in color. If you’re a high-volume printer, you’ll definitely be saving money with the ET-2600 and ET-2650. The integrated EcoTank gives you a total of 4500 black and white pages, or 7500 color pages. If you’re printing a few pages per day, or 150 pages per month, these tanks will last two full years. Of course, there are some types of printing that use a little more ink. If you’re printing full size photos, you’ll use twice as much ink as a standard document, so you’ll need to factor this into your calculations. 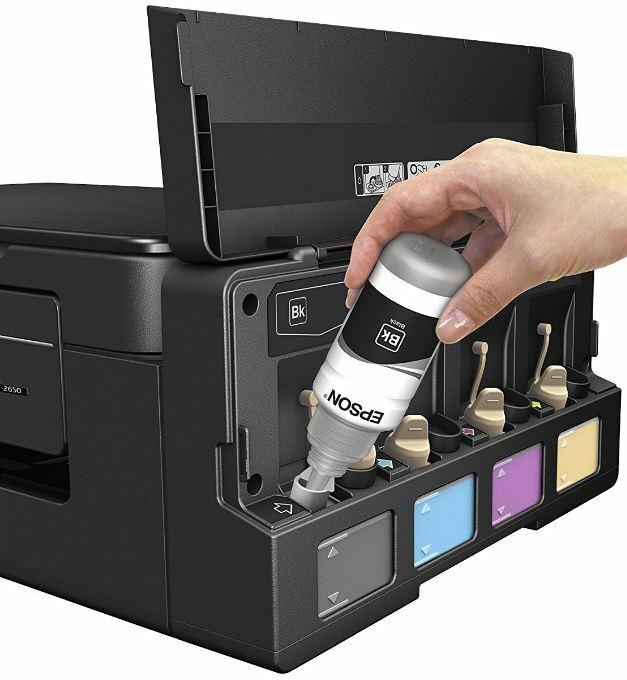 Overall, most users will find that this printer costs about 70% less than comparable inkjets. While it might not be as cheap as laser printer, you really need a print volume of 500 pages a month for laser to be worthwhile. The only issue with the EcoTank system is for low volume print users. The ink will start to go bad after about 2.5 years. If you only print a few sheets a week, you can’t buy this printer expecting the ink to last you 10 years. Epson has never been a bargain basement manufacturer. There printers do cost a little more than competing models, but they more than make up for it with their functionality. Spending a little extra money now will slash your ink prices beyond what you ever would have expected, making this printer an investment that can last a long time. What we liked the most about the ET-2600 and ET-2650 was the fact that it’s well balanced. As we expected, it’s a great document printer. But it’s also surprisingly good at printing photos, and the scanner is above average in its class. If we had to pick a printer that would last us for many years, this one would definitely be on our list. Is it going to be for everyone? Not necessarily. 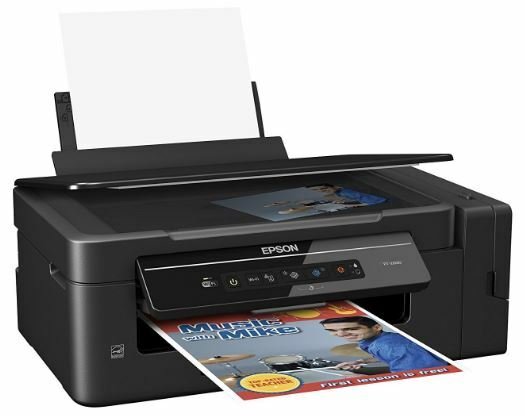 If you’re looking for a compact printer for casual use, Epson’s XP-640 might be a better option. It’s more compact, and designed primarily for people who print under 100 sheets per month. Maybe you’re going the other way, and want a larger printer to handle small to medium sized office needs. In that case, check out the ET-4500 EcoTank. It uses the same EcoTank system, but is designed for higher capacity applications. After a little research, the 2650 has a slot for SD card printing and supports Wi-Fi Direct (a peer-to-peer protocol that allows you to print from and scan to mobile devices without a network). Thanks for the comprehensive review of the ET-2600/2650’s. This was a great help in helping me to decide on weather or not to purchase an ET-2600. It sounds like the printer I need. My current Epson Stylus Photo R300 Printer has been an excellent machine over the many years I have had it, unfortunately it is now that old (I have reset the program three times) the foam at the bottom of the printer is breaking up and appears to have blocked some of the ink nozzles. Now its time to move on to another printer. As an aside, I do my scanning using an Epson V850. I can’t load paper. It doesn’t “catch” the paper when I feed it. Any tips? Thanks. Purchased the ET-2650. Set up good – easy. Hit and a miss with the paper feed at back. Some paper wants to move sideways so tries to print that way as such. I guess i miss the paper tray option. No USB option – first thing i noticed when i was look at it in the shop to buy. I like to save scanned documents to USB. I guess i will look at other methods for this process. Expensive unit. Hopefully the savings with ink will far outweigh the initial cost. I hope its: good things come in small packages. Will need to get used to much smaller printer than the big office beast. Do you know how well the heads stay clean? I have had an Epson printer for the past 3 years, and I have been really frustrated by it because it begins to print really blurry. When I clean and realign the heads it gets better only until the ink gets low, and then I have to replace the ink cartridges before their empty so that I can get the printer to print legibly. I really love the concept of no cartridges, but I am wary of the heads going bad. with the ink injection. The copies are coming out in black only, are blurred, broken up ant the text content scattered all over the page. There appears to be no “push button ” solution to this problem. Is it a technical fault or a programming glitch? Any help appreciated. I have had an Epson ET-2650 for about a year now and i haven’t been happy with it at all. I make buttons and the prints are so bad that i have to go to staples to print out anything. The colors are not true at all to what I’m seeing on the screen of my macbook pro. i have tried printing using the settings in the printer and i have also tried printing through photoshop. nothing works. i feel like i through my money away in buying this printer. I really wanted to like it but it just came up short.